Mar 26, 2017 Popular German Streamers Told They Now Require License By Government. When the FakeNews meme broke a few months ago astute observers understood this was going to be cover for licensing the Internet. But the German Government of Angela Merkel has found a much simpler way of bringing the free Internet under state control. The EU is putting disproportional pressure on Facebook to root out Fake News, citing "recent events" meaning the EU Presidential election. The continuous pressure, spearheaded by the Merkel Government in Germany, stands in no comparison to the relatively small problem. Most false news reports are emanating from Russia and is very easy to spot. Sources and argumentation is usually omitted. We have to read to the conclusion of the article in FT to get an inkling of what the EU is working towards. So that's it! EU Internet permits would have only advantages from the point of view of the EU. 1. Anonymity would be a thing of the past. 2. Online behavior can be regulated. 3. Dissent can be flushed out. 4. And last but not least, it would provide a tax base for the EU, a competence reserved for real states, what the EU desperately aspires to be! This is how it's always been done, wireless radio and television went the precise same way. Gird your loins for EU regulation of the Internet. Orwellian. Efforts to make sure certain facts and views are hard to find or are discredited in the last free frontier. The globalists are moving at lightning speed. Obama wants a truthiness test, so Google gives him one as a courtesy to the Government. So now let's fact-check if it's true that pigs may fly. RED ALERT! OBAMA WANTS TO CENSOR THE INTERNET! 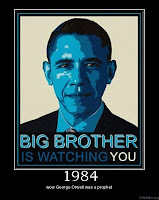 On Oct. 1 Obama signed administration of the free Internet over to a globalist entity. In the video above we hear Obama talking at the Frontiers Conference on Oct. 13. A better name would have been the No Frontiers Confab. The Frontiers Conference was co-sponsored by The White House, Carnegie Mellon University and University of Pittsburgh. It brought "together some of the world's innovators in Pittsburgh to discuss how science and technology frontiers will help improve lives, including progress and investments that are keeping America and Americans on the cutting edge of innovation." That apparently doesn't include objective reality, but rather Obama's subjective version. Net Neutrality: Where's Your Internet License? Net neutrality is a Government solution for a problem that does not even exist. But just in case Internet providers one day might start hating their customers, Government regulation would turn the free information highway into a regulated utility, like the ehm you know, the Ministry of Information? Proponents of Government intervention say that 'net neutrality' will "save the Internet." But does the Internet need saving? Government regulation (whatever the consequences) is antithetical to freedom. As such, net neutrality is the political exploitation of a free medium that is not publicly owned. In other words, it's a power grab, nationalization in our time. But to some people everything is political and they would gladly turn the free information highway into a public utility. The proponents can't even be honest about it: here's the hypocrisy of it all! And perhaps it is no great surprise that Soros appears to be behind the power grab. Government assault on the free flow of information continues. Obama has transfered the Internet Corporation for Assigned Names and Numbers (ICANN) on Oct. 1, 2016 to the control to a globalist entity, calling for censorship. The EU is threatening legal action against fake news. Government intervention for a level playing field! Except that equalizing can only be done downward, which is a pity if you're looking for quality. Hero and patriot Ed Snowden has revealed an array of state surveillance networks, from the US to EU countries like the UK and France. He has now outed himself as a CIA spook. Oct. 23, 2014 HLS Professor Lawrence Lessig interviewde Edward Snowden op de Harvard Law School op 20 okt. jl. Europe is once again acting according to her nature: Americans are born free, Europeans are born illegals. Fears government agencies can listen in to private mobile phone calls at the ‘flick of a switch’ after Vodafone reveals authorities use secret wires across its entire network which stretches to 29 countries. In six of the countries in which Vodafone operates the wires are a legal requirement, with laws obliging telecommunications companies to install direct-access pipes or allowing governments to do so. NBC's interview with Edward Snowden. UPDATE: Edward Snowden gave a wide-ranging interview with "NBC Nightly News" anchor Brian Williams in Moscow, in which he discussed his life in exile since leaking classified documents about the U.S. government's mass surveillance programs. The effects of Snowden's leaks were felt in Washington this week, as the House moved to pass a bill to end the NSA's bulk collection of domestic data. That Snowden outs himself as a CIA spook, requires us to a re-appraisal of his character in accordance with this analysis. According to some, NSA/Obama violated the 4th Amendment, giving Snowden the moral and legal right to act as he did. Here's one extraordinarily intelligent young man, a valiant patriot and a true hero. The exclusive interview will air Wednesday, May 28, at 10 p.m. ET. Republican senator Rand Paul is suing President Obama for violating the Fourth Amendment. Judge Jeanine talks about the class action with Jay Sekulow and Matt Kibbe. In the latest fallout from the Snowden leaks, which exposed illegal government snooping, Paul is joining with the Tea Party-aligned FreedomWorks group in suing Obama, the NSA and the FBI for violation of Fourth Amendment rights. Paul is confident the case will go all the way to the Supreme Court. The Fourth Amendment is designed to protect Americans from unreasonable searches, something Paul says Obama has publically refused to stop. Yaron Brook, director of ARC explains how the NSA spying business is caught up with the War of Terror. Which is caught up with a book titled "Winning the \Unwinnable War" . The Internet Is Compromized. What Can You Do? Just in: viral request by the Consensus Bureau... hmm "Groovy Snowden"
Orwell's dystopia isn't the normal state of humanity.. This article "A Manifesto for the Truth" by Edward Snowden was published last Sunday in Der Spiegel. It was written on November 1, 2013 in Moscow and was sent to Spiegel staff over an encrypted channel. The October EUCO is in large part about the Snowden revelations that the NSA has been tapping calls in France and in the Netherlands; even Angela Merkel appears to have been a victim. The White House is vague on the issue: Jay Carney has said there are currectly no taps that he is aware of, but was unclear whether this was the case in the past. Merkel has had a serious talking to with the Obama last night. Snowden: "NSA Harvests our Online Address Books"
Here's the first video of Edward Snowden since he went under ground in Russia. And he gets it exactly right: it is not about any particular program, but about a trend in the relationship between the governed and the government. It's about liberty. When the governed are subjected to arbitrary rule by the government, that's called tyranny. Here's a means of control that wants close monitoring by freedom watchers: biometrics and its fields of application, health care and environmentalism.. because, who doesn't want good health care and a clean environment? The rumour mill around Apple's California headquarters is spinning mighty fast. Word has it that the Silicon Valley tech giant is cooking up a new, market-smashing product to rival the iPod, iPhone and iPad. The smart money is on something to do with biometrics, very possibly an iWatch. Simon Giles is hoping the word in the blogosphere might prove correct. Global lead for the Intelligent Cities Initiative at management consultancy firm Accenture, he believes biometric data (or "quantified self data" as the wonks call it) is set to become "absolute gold dust" for smart city planners. "These data sets will increase understanding of individuals, in terms of how they relate to a city and how they perform themselves as kind of human machines, but also how they react with the physical environment within which they are in in cities", states Giles, a former adviser to the World Economic Forum on smart grids and green growth. Snowden: "UK government now leaking documents about itself"
It appears that the UK government is now seeking to create an appearance that the Guardian and Washington Post's disclosures are harmful, and they are doing so by intentionally leaking harmful information to The Independent and attributing it to others. The UK government should explain the reasoning behind this decision to disclose information that, were it released by a private citizen, they would argue is a criminal act." The Independent: "Snowden, 'UK Has a Secret Mid-East Internet Surveillance Base'"
The partner of Glenn Greenwald, the journalist at the British paper The Guardian, who broke many of the Snowden revelations, has been detained by the UK under an anti terrorism law. It was an ill disguised attempt at intimidation. Latest Snowden Leak: What is XKeyScore? Latest Snowden Leak: "XKeyScore Taps All You Do Online"
The National Security Agency's top-secret program essentially makes available everything you've ever done on the Internet — browsing history, searches, content of your emails, online chats, even your metadata — all at the tap of the keyboard. The latest information revealed by Edward Snowden comes from XKeyscore training materials. The NSA sums up the program best: XKeyscore is its "widest reaching" system for developing intelligence from the Internet. Who knew? EU-NSA exists. PDF. It's called the EU Intelligence Centre (INTCEN). Up to 2012 it was called the Joint Situation Centre – SitCen. The EU Council at the time hadn't decided to its foundation, but EU INTCEN was simply called into existence by the EU Foreign Policy czar, Javier Solana (Spanje) and then tranfered to the authority of Catherine Ashton. EU INTCEN is so secret, it ows responsibility to no one. There is some infornmation in a Dutch language book by Katrien Temmerman: "Terreurbestrijding in Belgie en Europa, de interactie tussen inlichtingendiensten, politie en justitie". (Source (Dutch)) It doesn't talk, but you can follow @EUINTCEN on Twitter. Has Snowden Applied to Join a KGB Union? Edward Snowden has applied to join a group of former Russian KGB security, intelligence, and police officials, reports say. It would likely change Snowden’s status from that of a whistleblower seeking to expose wrongdoing, to an intelligence defector who has changed sides. Well, not so fast. Perhaps not... “Snowden did not address any letter to any association,” Snowden's lawyer Kucherena told The Moscow News. “Where it came from, whose fabrication it was, it’s difficult for me to say.” Snowden himself denied (...) “It’s surprising that the leaders of this [association] believed it,” Kucherena said. Snowden and his lawyer Kucherena conversed in the transit zone, according to an Interfax source. UPDATE: Reports are very confused. Earlier it was reported that Edward Snowden was ready to leave the airport. Currently we are advised that Snowden will have to stay at Moscow airport a little longer, as his asylum request is still being reviewed by Russian Immigration Authorities, according to his lawyer. From an article published this week on WaPo it transpired that the NSA is using an array of espionage programs to locate mobile phones. Terrorists have known this for a long time. They are well aware never to use a mobile phone twice. Phones used as detonators for bombs or for pyro terrorism (to set forest fires) are brand new and never used before. Otherwise they can be traced. It now transpires, by the NSA. A basement at NSA HQ in Fort Meade, Maryland houses the 'Geolocation Cell' team. An array of technology is used to trace the location of phone numbers or to set targets for drone attacks. This meant that if the NSA were following a phone metadata or web trail from a terror suspect, it could also look at the calls from the people that suspect has spoken with—one hop. And then, the calls that second person had also spoken with—two hops. Terror suspect to person two to person three. Two hops. And now: A third hop. Think of it this way. Let's say the government suspects you are a terrorist and it has access to your Facebook account. If you're an American citizen, it can't do that currently (with certain exceptions)—but for the sake of argument. So all of your friends, that's one hop. Your friends' friends, whether you know them or not—two hops. Your friends' friends' friends, whoever they happen to be, are that third hop. That's a massive group of people that the NSA apparently considers fair game. (Source) Related: NSA Chief Keith Alexander: "We thwarted more than 50 potential terrorist plots across the globe". Author Brad Thor: "PRISM is one of the most benign things NSA has"
Has Edward Snowden become illiterate? The Russian Migration Service confirmed it has received whistleblower Edward Snowden’s application for temporary asylum. It can take authorities up to three months to consider his request. In the meantime, Snowden may be transferred to a refugee center. Obama administration drowning in lawsuits filed over NSA surveillance. Among others by the Electronic Frontier Foundation; American Civil Liberties Union; the Electronic Privacy Information Center; First Unitarian Church of Los Angeles; Bill of Rights Defense Committee; Calguns Foundation; California Association of Federal Firearms Licensees; Council on Islamic Relations; Franklin Armory; Free Press; Free Software Foundation; Greenpeace; Human Rights Watch; Media Alliance; National Organization for the Reform of Marijuana Laws; Open Technology Institute; People for the American Way, Public Knowledge; Students for Sensible Drug Policy; TechFreedom; and Unitarian Universalist Service Committee. Greenwald: "Snowden Could Be US' Worst Nightmare"
Edward Snowden possesses dangerous information which could potentially lead to America's "worst nightmare" if it is revealed. But that's not his goal. Snowden's objective is to expose software that people around the world use without knowing what they are exposing themselves to. The US government should be on its knees every day begging that nothing happen to Snowden, because if something does happen to him, all the information will be revealed and it could be its worst nightmare. Greenwald himself does not have access to the "insurance" documents and played no role in arranging the dead man's switch. The most important thing [for Snowden] is not to end up in US custody. He described the Obama approach to people who reveal uncomfortable truths as "vindictive". The oft-repeated claim that Snowden's intent is to harm the US is completely negated by the reality that he has all sorts of documents that could quickly and seriously harm the US if disclosed, yet he has published none of those. WHITE HOUSE, "RUSSIA'S SNOWDEN PLATFORM NOT NEUTRAL"
UPDATE: White House spokesman Carney criticizes Russia for giving Snowden a "platform for propaganda". The US wants Snowden returned to US, said Carney. "Providing a propaganda platform" for Snowden "runs contrary" to Russia's stated neutrality in the case". 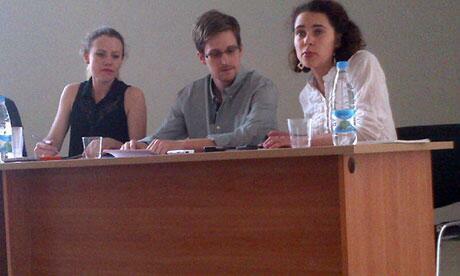 Snowden has held a presser in Moscow. 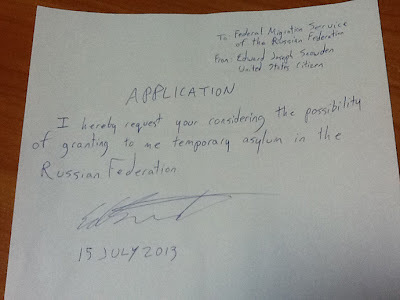 Big news is that he is applying for political asylum in Russia, despite Putin's condition that he stop publishing. An asylum request by Snowden to Russia puts the Kremlin between a rock and a hard place. Human Rights Watch's Tanya Lokshina has given a debrief on her meeting with Snowden and his chances of getting asylum in Russia. More from Human Rights Watch's @TanyaLokshina on #Snowden Lokshina: "He says that he wants to go to Latin America eventually but that for the time being he needs asylum here in Russia". Snowden asked attendees for two things: to ask Putin to support his Russian asylum application and to ask US/EU to not interfere with his movements. Snowden thinks Putin's condition for his asylum - that he must stop damaging Russia's 'American partners' - isn't a problem. Attendee Olga Kostina: "Everything he had wanted to publish he has already published," so Putin's condition is a non-issue. WikiLeaks has posted the statement Snowden read to the human rights groups he invited to today's meeting. “I announce today my formal acceptance of all offers of support or asylum I have been extended and all others that may be offered in the future,” Snowden stated on Friday during his meeting with rights activists and lawyers at Moscow’s Sheremetyevo Airport. “With, for example, the grant of asylum provided by Venezuela’s President Maduro, my asylee status is now formal,” his address reads. Snowden also said that he is going to seek asylum in Russia, since he cannot fly to Latin America yet. "Brace for More Snowden Revelations"
The US lost no time requesting the extradition of Edward Snowden from Venezuela - full text. Not all revelations make Snowden a hero of the people! Marc Thiessen makes the case for Snowden, the traitor. Oh and Ecuador claims its London embassy, where Assange is holed up, is bugged.. the country will shortly reveal who done it.. The EU and Japan take over Internet from the private sector, turning it into a corporatist public utility. Don't be surprised governments take the right to do mass data tapping. This initiative brings together the European Commission, the Japanese Ministry of Internal Affairs and Communication (MIC), the National Institute of ICT (NICT) along with European and Japanese industrial players, leading universities and R&D centres, such as Orange, Telefonica, NEC, Panasonic, NTT, KDDI, ADVA, STMicroelectronics and Intel. Several countries, including Ecuador, said they could not consider an asylum request from Snowden unless he was on their territory. Norway said he was unlikely to get asylum there, Brazil ruled out even answering his request and Poland said it would not give a "positive recommendation" to any application. Finland, Spain, Ireland and Austria said he had to be in their countries to make a request, while India said "we see no reason" to accept his petition. France said it had not received a request and China's Foreign Ministry spokeswoman said she had no information on Snowden's asylum request. Officials in Russia, which has made clear it wants Snowden to leave, say an embassy car would be considered foreign territory if a country picked him up. Snowden makes a strong statement, "unbowed in convictions"
SNOWDEN, "US IS ILLEGALLY PERSECUTING ME"
Snowden has applied for political asylum in Russia, a Russian immigration official said on Monday. According to the official Snowden’s application was hand-delivered to a Russian consulate in Terminal F of Moscow’s Sheremetyevo Airport late Sunday evening by Sarah Harrison, an activist for WikiLeaks traveling with Mr. Snowden. "NSA GET LIVE ALERTS WHEN TARGETS LOG ON"
Today we are presented with what may well be a piece of tactically placed misinformation. Yesterday The Guardian (the paper that first broke the Edward Snowden revelations) published an article which has since been pulled. The item was an "exclusive front-page report about "secret European deals to hand over private data to America" (screen shot left). The source turned out to be a rather unreliable conspiracy theorist, called Wayne Madsen, an adherent to the 'birther' hypothesis (that Obama wasn't born in the USA and spent millions to cover it up, which is true) and the suggestion that Obama is gay (which probably isn't). We may be wrong footed here by the time honored technique favored by the left of refuting the story by smearing the source (a variant of blaming the messenger). It is in fact a fallacy, as the aforism of the broken clock which is also right twice a day, attests to. The effect of misinformation is two fold: it makes that particular story look decidedly dodgy, 2. and is casts doubt on the entire operation. If Madsen is fishy, can Snowden and The Guardian be relied on? Madsen's news network, World News, seems mainstream enough. No conspiracies there. You be the judge. True or false? "EU furious, worried, SHOCKED", demands an explanation, talks of "tremendous repercussions"! The Obama admin is "checking"..
ECUADOR: "SNOWDEN MAROONED IN RUSSIA"
Snowden is "under the care of the Russian authorities" and can't leave Moscow's international airport without his U.S. passport, Ecuadorean President Rafael Correa told AP Sunday. Correa said he had no idea Snowden's intended destination was Ecuador when he fled Hong Kong for Russia last week. He said the Ecuadorean consul in London committed "a serious error" without consulting any officials in Ecuador's capital when the consul issued a letter of safe passage for Snowden. He said the consul would be punished, although he didn't specify how. Snowden Indefinitely in Limbo on Moscow Airport? Edward Snowden hasn’t been spotted on Thursday’s flight from Moscow to Cuba and has no ticket out of Russia over the next three days. With no valid passport, looks like he's stuck in limbo on Moscow Sheremetyevo indefinitely. The ground on which China refused extradition is now known: the American paperwork omitted to specify Edward J. Snowden's middle name..
Putin confims Snowden is still in Moscow Sheremetyevo transit area. His hands are tied! The US regime says Moscow is 'hiding' the whistleblower. YOU CHOOSE! SECURITY OR LIBERTY? Max Keiser: "International confidence in US economy ‘crumbling’ after Snowden leaks"
Ron Paul: "Why Is No One Listening to the US Government?" Carney says US government is in touch with countries through which NSA leaker Snowden might travel. Snowden has given the assembled press the slip. BREAKING: Edward Snowden signed on to work with intelligence contractor Booz Allen Hamilton only to obtain information about the United States’ surveillance programs, the NSA leaker tells the South China Morning Post. Obama's war on whistle-blowers is outrageous. Snowden is safe, healthy, but it's a secret where he is. Obama has invoked the espionage act at twice the rate of previous administrations. The result will be the complete destruction of security journalism. The US government take on a generation of people who find mass violation of privacy unacceptable. This is not the way to fix government violations. The charges against Snowden are not a matter of justice, but of intimidation. "US is in breach 4th and 5th Amendment of US Constitution and of UN human rights", stated Snowden in a letter to the President of Ecuador. FM: Is it people who've been betrayed, or certain elites? FM: We don't have information where Snowden presently is. UPDATE: Schumer is seething with the Russian 'allies', Kerry is furious the Chinese let Snowden leave after the US filed extradition charges. The Chinese for their part claim the paperwork wasn't in order. Diplomatically things are now also in disarray. Audio. Video. UPDATE: US Secretary of State John Kerry has said that America is not aware about the intended travel destination of former NSA contractor Edward Snowden but he "would be deeply troubled" if China and Russia knew about the travel plan. It also said the plane for Havana will cross US air space. 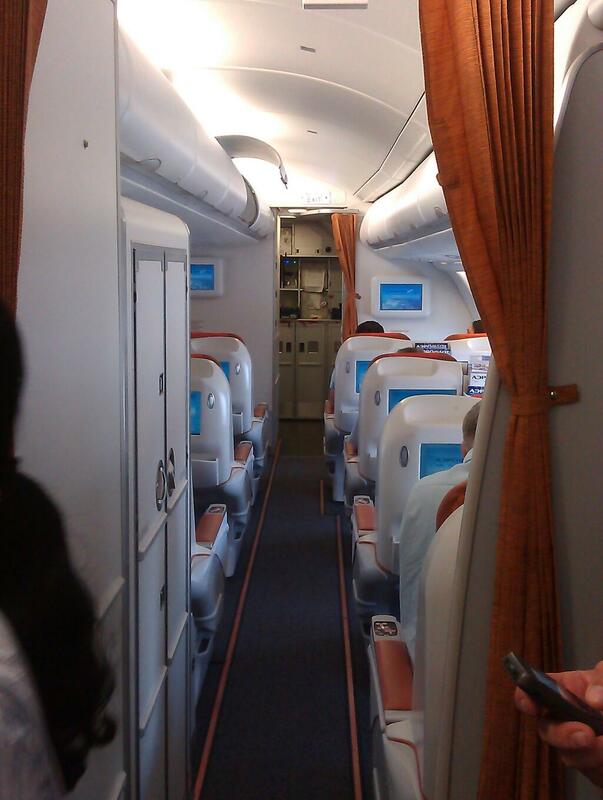 UPDATE: Snowden’s plane leaving Moscow, NSA leaker not seen aboard. The next flight to Havana is at 16:20 local time, in under two hours from now. Audio. A source at Russia's Aeroflot airline said Snowden would fly from Moscow to Cuba on Monday and then planned to go on to Venezuela. The South China Morning Post earlier said his final destination might be Ecuador or Iceland. WikiLeaks said it helped Snowden find "political asylum in a democratic country" (whatever that means). SNOWDEN: "UK TAPS EMAIL, FACEBOOK, BROWSERS"
The Guardian is reporting that British intelligence, is directly tapping into fibre optic cables for worldwide, international phone and Internet traffic. This information was revealed by whistleblower Edward Snowden. GCHQ is sharing the information with the American National Security Agency (NSA). The program, code named Tempora, has been in operation for some 18 months. Taps have been installed on sites where the cables run ashore. On a daily basis some 600 million phone calls are being tapped. Besides phone calls GCHQ is tapping emails, postings on Facebook and computer browsing histories. According to Snowden it's even worse than NSA's PRISM program. About 850,000 NSA personnel have access to the information. Companies involved in the project were sworn to secrecy. According to an anonymous expert speaking to The Guardian, the selection criteria are secret, and the operation is legal. The source says Tempora has brought a number of serious crimes to light. Belgian newspaper De Standaard is reporting that a business man from Iceland has prepared a private jet in China to take whistleblower Ed Snowden to Iceland. "Everything is ready from our end. We are waiting for confirmation from the Iceland Ministry of Foreign Affairs", says Olaf Vignir Sigurvisson. Sigurvisson is CEO of DataCell, a company handling payments for Wikileaks. Iceland is well known for its Internet freedom, but Snowden was afraid the island nation might succomb for pressure from Washington. UPDATE: A U.S. government watchdog is examining a contractor that conducted a 2011 background investigation into Edward Snowden. Read on.. 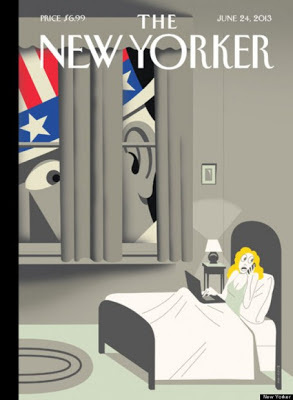 The New Yorker, "Uncle Sam Is In Your Bedroom"
The June cover of the leftist magazine The New Yorker criticizes the Obama administration over its massive surveillance programs. It shows a giant Uncle Sam looking into a girl's bedroom window as she talks on the phone and uses her computer in bed. The artist, Richard McGuire told the New Yorker, "George Orwell's ghost is shaking his head saying, 'I told you so'". Pic after the jump. UPDATE: The whistleblower behind the biggest intelligence leak in NSA history answered your questions about the NSA surveillance revelations. Read on..
Was Edward Snowden right in exposing NSA's legally and morally questionable policies? How trustworthy or ethical is Snowdon as a person and does his story hold up to scrutiny? Snowden now has his own Wiki. 4. Under the name TheTrueHOOHA, Snowden appears to have posted to ArsTechnica, a tech, IT, and geek culture site, hundreds of times over the last 10 years. Next disclosure from Snowden: A lot of our "diplomats" in foreign embassies? * Aren't really diplomats at all, they're CIA." Well, it figures -> "CIA Involvement in Weapons Transports to Syrian Rebels"
Paul snarks that PATRIOT Act author Jim Sensenbrenner's outrage is 'not coming from a deeply principled viewpoint'. More..
Snowdon's stunning dancer girlfriend says Snowden was set to marry her before he fled to Hong Kong. Lindsay Mills (28) says she feels 'adrift'. She wrote on her blog: "My world has opened and closed all at once. Leaving me lost at sea without a compass". The couple previously went to Hong Kong for a romantic getaway. Mills is a dancer who attended the Maryland Institute College of Art. She performs with the Waikiki Acrobatic Troupe. View photos and video of Mills performing..
Snowden says he is not trying to run from justice. "People who think I made a mistake in picking [Hong Kong] as a location misunderstand my intentions. I am not here to hide from justice; I am here to reveal criminality", the South China Morning Post quoted Snowden, 29, as saying. Snowden spoke to the paper from a "secret location" in the city. He hadn’t been seen since he checked out of a Hong Kong hotel on Monday. "I’m neither traitor nor hero. I'm an American", Snowden said. NSA contracting firm Booz Allen Hamilton discharged Snowden yesterday. Snowden said he would fight extradition. In a letter Google asked Attorney General Eric Holder and FBI Director Robert Mueller to reveal information about the number and scope of national security requests for data, including court orders under the Foreign Intelligence Surveillance Act (FISA). Google already reveals statistics about government requests for user data in its Transparency Reports, but the company is barred from discussing or even acknowledging the existence of FISA orders. In the letter, Google Chief Legal Officer David Drummond said the company has worked "tremendously hard" to earn its users' trust. "For example, we offer encryption across our services; we have hired some of the best security engineers in the world; and we have consistently pushed back on overly broad government requests for our users’ data," he wrote. Read more..
A spokesperson for the European Commission (the EU's executive branch) has told the tech site Gigaom that according to the EC, PRISM is an "American internal affair", even though PRISM is specifically targeting non US citizens outside the USA. According to Gigaom Europe..
"is already in the throes of a wide-ranging debate over data privacy. The EU's new data protection laws are being formulated, with treats in store including enhanced responsibilities for non-EU cloud firms when it comes to protecting the privacy of European citizens. This has prompted a pretty shameless lobbying campaign by U.S. tech firms to see the new rules watered down. Activist members of the European Parliament (MEPs) such as Jan Philipp Albrecht @JanAlbrecht have been fighting back". Russia is considering granting political asylum to Edward Snowden, Russian media reported. Snowden dropped off the radar Monday after checking out of a Hong Kong hotel. The revelations of Edward Snowden have been condemned by US lawmakers, who threatened the whistleblower with prosecution. Senator Dianne Feinstein (D-CA) on Monday called Snowden’s NSA leaks an "act of treason". Chairman of the House homeland security subcommittee Peter King stressed that the leaker must be prosecuted "to the fullest extent of the law" and the US should begin "extradition proceedings at the earliest date." Regina Ip, formerly Hong Kong’s top official overseeing security, told reporters it would be in Snowden’s "best interest to leave Hong Kong", citing an extradition treaty with the US. "I’m willing to sacrifice all [that] because I can’t in good conscience allow the US government to destroy privacy, internet freedom and basic liberties for people all around the world with this massive surveillance machine they’re secretly building. The greatest fear that I have regarding the outcome for America, of these disclosures, is that nothing will change". The question is this: the status of whistleblower may pertain to the revealing of unlawful activities, but what about a government and a political system that has covered its legal tracks, but is morally out of the order? And, the fact that all three US branches signed off in it, does that make it legal or constitutional? Snowden Gone Missing. Is He a Hero or a Villain? Edward Snowden has gone missing from his hotel in Hong Kong after revealing sensitive information about secret surveillance of people's phone and internet records. A whistleblower uncovers illegal activity but the police state surveillance was "legal and court-sanctioned". On the other hand, a Senator said today Congress has never approved what the Obama regime ended up doing. How To By-Pass NSA Data Mining? Tired of the National Security Agency collecting your personal details? There’s an app for that. In light of reports that the U.S. government has gained direct access to the systems operating Google, Facebook and Apple, the fact the National Security Agency is mining billions of Verizon telephone records for details, a product that has been released by developers in South Africa. The product called Seecrypt is able to block the connections that otherwise would allow the NSA to look at your phone records and find out the details of your calls. "For the app to work, both people wanting to text or call each other must have the application. But when the application is used, the phone company will not know the identity or phone number of the other person on the line. It will only know that the caller used Seecrypt". Read more..
Booz Allen Hamilton scrambled to distance itself from Snowden, confirming in a press release that Snowden worked for the company in Hawaii, but noted that he had only been employed by the firm for three months. "News reports that this individual has claimed to have leaked classified information are shocking, and if accurate, this action represents a grave violation of the code of conduct and core values of our firm. We will work closely with our clients and authorities in their investigation of this matter". A Booz Allen spokesperson declined to comment further. (...) Snowden’s leaks first came to light Wednesday, when the Guardian published a top secret order from the FBI sent to Verizon on behalf of the NSA, demanding the call records of every American customer of Verizon Business Network Services. In the next two days, the revelations of that broad NSA surveillance widened to include AT&T and Sprint, a PowerPoint presentation on an NSA program known as PRISM that boasted of access to the data of Google, Microsoft, Facebook and others, an executive order from President Obama calling for the NSA to draw up a list of cyberattack targets, and an NSA tool known as Boundless Informant for tracking its snooping in countries around the world. The Verizon order in particular seems to reveal something about the timing of those leaks. Read on..
Edward Snowden donated some $500 to Ron Paul’s presidential campaign in 2012. In 2008, he voted for a third party candidate, but he believed that Barack Obama's presidency would shut down the violation of privacy rights. He thought to disclose it then, but decided to wait because of Obama's election. But Obama continued with the policies of his predecessor, so Snowden decided to finally blow the whistle. UPDATE: The man who blew the whistle on the biggest data tapping scandal in history has been found. It's the 29 year old technician Edward Snowden, here in the interview confessing he no longer wished to live in a society where an Obama is able to spy on the world's population at will. He is now living under cover in Hong Kong. UPDATE: From Zerohedge - Everyone Is Lying, By Law! Zuckerberg: "Facebook is not and has never been part of any program to give the US or any other government direct access to our servers." Google CEO Larry Page: "We have not joined any program that would give the US government – or any other government – direct access to our servers." One small problem: they are all lying. The NYT explains just how the explicit handover of private customer data from Corporate Server X to NSA Server Y takes place. (...) And there you have it: backdoors, locked (and not so locked mailboxes), and internal corporate firewalls in which some employees know everything that is going on and are used as a Chinese Wall scapegoat by everyone else who was shocked there is snooping going on here, SHOCKED. Essentially, the slide suggests that the NSA also collects some information under FAA702 from cable intercepts, but that process is distinct from Prism. Analysts are encouraged to use both techniques of data gathering. "You Should Use Both." You know: just in case only one is insufficient to make a mocker of all personal rights and civil liberties. TSA’s surveillance of our communications is most likely much, much bigger than [metadata]. Technology has made it possible for the American government to spy on citizens to an extent East Germany could only dream of. (The Atlantic is correct.) The New York Times Editorial Board says that Obama has lost all credibility (and slams defenders of the Big Brother spying program).. Read on..
Internet Corporations are denying cooperation with NSA. BREAKING: The United Kingdom and European Union (German) are also caught up in NSA scandal. Even the UN special envoy for the freedom of speech, Frank La Rue has expressed his concern. Slide depicting the top-secret PRISM program. Former CIA Director David Petraeus is guest at the 2013 Bilderberg conference to help construct the 'big data' grid, the new frontier in spycraft. The subject is on Bilderberg's official agenda for 2013 ("How big data is changing almost everything", a reference to how the Internet is transforming the world of surveillance and the ability to foresee and manipulate future events). It is therefore very ironic that today the news should break, that the biggest 'conspiracy theory' involving the NSA has become conspiracy fact! 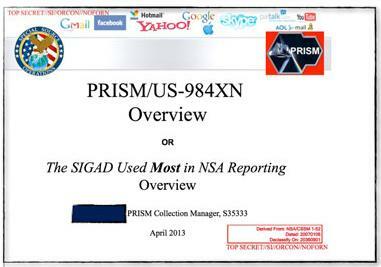 The program, code-named PRISM, has not been made public until now. It may be the first of its kind. The NSA prides itself on stealing secrets and breaking codes, and it is accustomed to corporate partnerships that help it divert data traffic or sidestep barriers. But there has never been a Google or Facebook before, and it is unlikely that there are richer troves of valuable intelligence than the ones in Silicon Valley. Read on.. The Obama administration has been quietly collecting millions of telephone records from U.S. Verizon customers under a top-secret court order first obtained in late April, according to British newspaper The Guardian. A copy of the classified order, posted Wednesday on the newspaper's website, reveals that Verizon has been required to provide to the National Security Agency on an "ongoing, daily basis" information on all phone calls made through its systems. It doesn't stop there! American telecoms giant Verizon has been handing information about British companies to the US government, putting it on a collision course with UK regulators. Inspired by George Orwell's "1984"
Feel the urge to tweet about something trivial about the whether or your concern about cyber security, think again. You might use words that get to U.S. Department of Homeland Security sit up from its coffee break. The U.K's Daily Mail reported that the DHS has been forced to release a list of keywords and phrases it uses to monitor various social networking sites. The list provides a glimpse into what DHS sees as "signs of terrorist threats". The list was posted by the Electronic Privacy Information Center who filed a request under the Freedom of Information Act. The information sheds light how government analysts are instructed to monitor the internet looking for domestic and external threats. What wasn't revealed is how the agency actually gains access to the various search engines and social networks to monitor the specified keywords. Perhaps they contracted with Google, Facebook, Microsoft, Yahoo and Twitter to gain secure direct API access. This type of access would enable DHS to use distributed cloud technologies to monitor the daily flow of social media and search activity in something close to real time. Given the extent of the monitoring, this post itself may appear on the DHS radar, so please feel free to leave a comment with any insights.